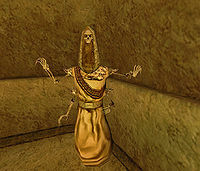 Typically found guarding tombs throughout Morrowind but can also be summoned by mages. The ghost is not particularly tough but it is immune to normal weapons. The spell to summon them refers to them as "Ancestral Ghosts". 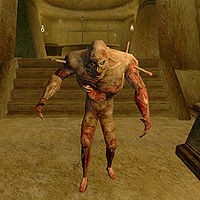 A revenant that is usually found protecting the tombs scattered throughout Morrowind. 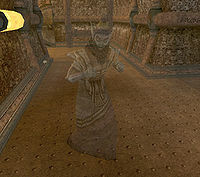 Another form of revenant that guards the tombs throughout Morrowind and can be summoned by magic users. 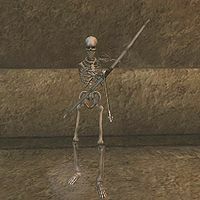 Though not as powerful as other undead, the Bonewalker is feared for the terrible curses it can bestow on its foes. 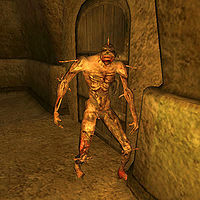 The Greater Bonewalker is a more powerful form of this creature which can also be found in graves and tombs throughout Morrowind. Like its lesser cousins, it may bestow powerful and hideous curses, but these effects do not go away, even if you kill them. Both versions also carry the common disease Brown Rot. 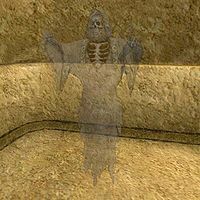 Ghosts of the Ancient Dwemer which can still be found haunting the halls of their ruins. The ghosts are typically sought as a source of Ectoplasm. Enchanted weapons or those of Silver or better quality are required to damage them. 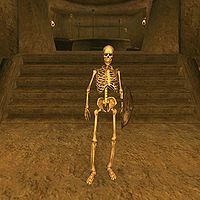 A common form of undead found guarding graves and tombs throughout Morrowind. This page was last modified on 16 April 2017, at 09:06.